From left to right, .357 Mag. K-Frames: 21/2″ Model 66, 23/4″ Model 66, and 4″ Model 66. In 1935 Smith & Wesson lengthened the .38 Spl. and introduced the original .357 Mag. revolver, which is now known as the Model 27. Built on the N-Frame, the new and powerful .357 Mag. became immediately popular with shooters. There was, however, one major drawback — it was a very heavy wheelgun. Some, most notably Border Patrolman Bill Jordan, started calling for a lighter-weight duty handgun. The result in 1955 was the first Combat Magnum, a .357 Magnum built on the smaller K-Frame. 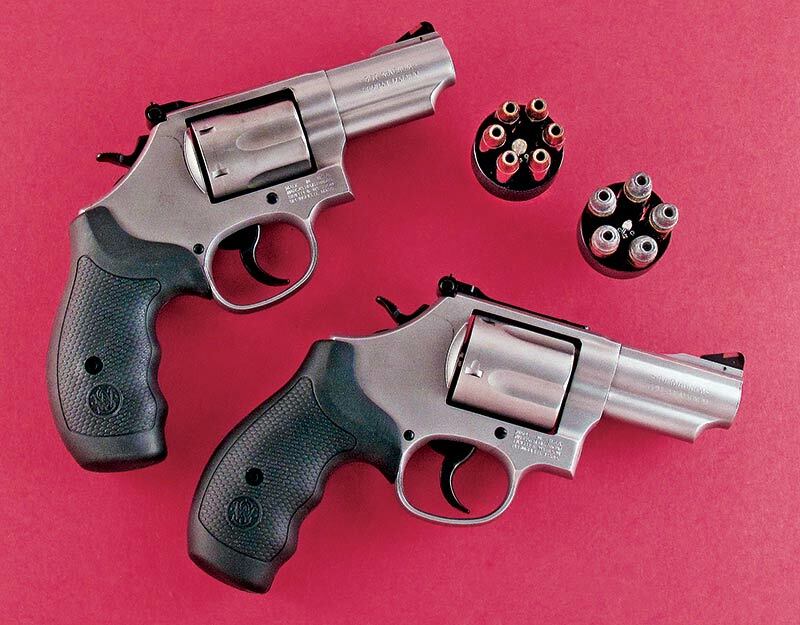 In the closing days of 1955 Smith & Wesson also introduced the first .44 Mag., which is now known as the Model 29. Now shooters had a choice of a relatively lightweight .357 Mag. or the larger N-Frame .44 Mag. However, the .357 Combat Magnum, which became known as the Model 19 and its stainless steel counterpart, the Model 66 which arrived in 1971, experienced problems in the forcing cone area. So, 30+ years ago Smith & Wesson came up with the L-Frame. The Model 586 and its stainless counterpart the Model 686 featured the same grip frame as the original Model 19 while increasing the size of the frame in the forcing cone area and also using a larger cylinder. The barrel also featured a full under lug. This newest Smith & Wesson was not as light and easy to pack as the Model 19/66, however it was much stronger and the problem in the forcing cone area was solved. Targets fired with the S&W .357 Combat Magnum. By the time the 21st century rolled around the Combat Magnum was gone. However, Smith & Wesson has now recently resurrected it as fraternal twins. Featuring “Combat Magnum” markings on their barrels, the two sixguns arrived in 2014 — one as a six-shot K-Frame Model 66 in .357 Mag. and the other a five-shot L-Frame Model 69 Combat Magnum in .44 Mag. Smith & Wesson reached for the epitome of a “perfect packin’ pistol” with the Model 69 Combat Magnum in .44 Mag. This is a stainless steel, five-shot, double-action sixgun. Sights are typical Smith & Wesson adjustable sights with a white outline rear sight matched with a red ramp front sight. The frame screws, hammer, trigger and cylinder release as well as the front and rear sight are matte black finish and contrast nicely with the matte stainless steel of the rest of this excellent big-bore revolver. The front of the cylinder is chamfered for easy entrance into a holster and the muzzle has a deep concave crown which protects the rifling. The grips are wrap-around finger-grooved style of pebble-grained rubber. The single-action trigger pull is 41/4 lbs. while the double action measures 14 lbs. The cylinder locks at the front of the frame with a modernized version of the Triple-Lock set up instead of locking at the front of the ejector rod. Since this is a five-shot .44 Mag., the locking bolt notches on the cylinder are in between chambers so there is no weak spot under each one. The Model 66 Combat Magnum .357 Mag. is not identical to the Model 69, but I think we can call it a fraternal twin with the basic difference being the chambering and it having 6 shots instead of 5. Call this another perfect packin’ pistol. S&W has brought back the classic Combat Magnum in the Model 66 .357 Mag. K-Frame (top) and the Model 69 .44 Mag. L-Frame (below). So what was left to do with these two sixguns? The answer of course was to turn them into perfect packin’ pocket pistols — for large pockets, of course. This is exactly what Smith & Wesson has done with both of these Combat Magnums, now offering them with 23/4″ barrels. Test-firing began with the Model 66 and I was soon surprised by the accuracy exhibited at a self-defense distance of 7 yards. I was also surprised at the relative mildness of the felt recoil as well as the very respectable velocities obtained with this relatively short barrel length. The Black Hills 158-gr. JHP clocked out at just under 1,100 fps with 5 shots in an astounding, for me, 1/2″ group at 7 yards followed by the Buffalo Bore 158-gr. JHP that grouped in 5/8″ with a sizzling reading on the LabRadar of 1,375 fps. Lighter bullet weight factory loads applicable for self-defense also performed exceptionally well. Hornady’s 140-gr. XTP-JHP registered 1,225 fps with a 11/4″ group; Speer’s 125-gr. Gold Dot JHP, 1,220 fps and 7/8″; and the Winchester 145-gr. SilverTip HP produced a 3/4″ group of 5 shots at 1,215 fps. I was also quite pleased with the results with two of my handloads using Rim Rock cast bullets. The 158-gr. SWC JHP over 15.5 grains of #4227 is just under 1,100 fps with a 11/8″ group while the 180-gr. LBT WFN heavyweight gas checked bullet with 14.0 grains of the same powder is just over 1,100 fps and a 1″ group. Barrel markings on the current Combat Magnums. Earlier I mentioned how I was surprised at the accuracy possible from the Model 66 Combat Magnum. I was even more surprised by what I was able to accomplish with the Model 69 .44 Mag. Combat Magnum. It proved to be even more accurate, and the most surprising thing to me was I was able to keep my concentration during recoil as the Model 69 is just 1 oz. heavier than the Model 66 at 34.5 ozs. Whether test-firing with factory or handloads, .44 Spl. or .44 Mag. loads, this latest .44 Mag. from Smith & Wesson routinely grouped its shots well under 1″ at 7 yards. Buffalo Bore offers several .44 Spl. Options, all of which perform exceptionally well. The 255-gr. Keith load clocked out at 880 fps with a 4-shot group at 7 yards of 7/8″; the 190-gr. cast hollowpoint, 1,015 fps and 3/4″; the 200-gr. Wadcutter Anti-Personnel load, 925 fps and 1″; and the Lead-Free Barnes 200-gr. TAC-XP registered 950 fps and a 3/4″ group. This is very consistent performance. Switching to my handloads, the most pleasant shooting Oregon Trail 240 RNFP over 5.3 grains of Trail Boss registered 700 fps and grouped in 3/4″ and is definitely a load which can be shot all day long. Switching to a little more powerful load consisting of the Lyman #429421 Keith bullet over my standard 17.5 grains of #4227 was just under 900 fps and also resulted in a 3/4″ group. Okay, I had waited long enough; now was the time to switch to .44 Mag. loads. My all-time favorite hunting load in .44 Mag. is the Black Hills 240-gr. JHP. Over the years it has racked up an impressive record of nothing but one-shot kills on Whitetail deer, exotic sheep and a cougar. In my long-barreled .44’s this load is 1,300 fps+, however it drops down to 1,060 fps in the 23/4″ barrel of the .44 Mag. Combat Magnum. It did shoot incredibly well with 4 shots in 5/8″ at 7 yards. Buffalo Bore also has a variety of .44 Mag. loads which are consistently accurate. The 255-gr. SWC load clocks out at just over 1,200 fps with a 7/8″ group and the two Anti-Personnel loads, both of which grouped in 3/4″, are the 200-gr. full wadcutter at 1,170 fps and the 180-gr. JHP which tops out at over 1,325 fps from the short-barreled sixgun. Winchester’s 210-gr. Silver-Tip hollowpoint is a relatively easy shooting 1,100 fps and puts all of its bullets in a one-hole 1/2″ group just barely larger than the diameter of the bullet. These days I rarely need full power loads and it was gratifying to see my “Easy Old Man Shooting” .44 Mag. load of the Lyman #431244 Thompson Gas Check over 19 grains of #4227 clock out at 920 fps with all the shots in 5/8″. This is definitely an everyday carrying load in the short-barreled .44 Mag. The latest .357 Magnum Combat Magnum is a six-shot K-Frame. Anyone who is a regular reader knows my heart belongs to the old classics and especially the classic double-action S&W sixguns produced before the 1960s. Long gone are the recessed cylinder case heads, pinned barrels and forged parts. These older guns may stir my soul more than the newer ones; however, we cannot take away the performance these newer guns provide. Any time they are stacked up against my favorite classics, they always win no matter whether the criteria be strength or accuracy. These two new Combat Magnums are no exception.